November 16, 2010 – San Jose, California Solar thermal manufacturer and distributor, Free Hot Water, is now offering pre-engineered commercial solar water heating solutions for small commercial applications, such as restaurants, Laundromats, and small apartment complexes. Residential systems are often pre-packaged in order to qualify for state rebate guidelines, but commercial Solar hot water designs must generally be customized for large solar thermal applications. However, small commercial applications are easier to approximate the hot water needs for common applications. The new pre-packaged commercial systems range from 6-collector system with a single storage tank for customers who use 171-330 gallons per day (GPD) of hot water to a 12-collector system designed for 616-800 GPD applications. All systems include all of the related components to complete a typical install. View this online chart to help calculate the number of panel’s necessary for a commercial or residential system. For larger commercial systems, Free Hot Water’s in-house engineering team can create customized designs for any solar thermal application, including solar space heating and cooling. 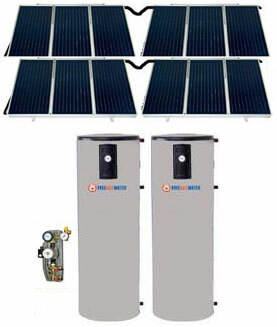 To become a solar distributor or installer and see the retail pricing of these systems, register at www.shop.freehotwater.com. To become a Free Hot Water distributor or installer and be eligible for our very competitive wholesale pricing, please “Create and Account”.